At CJB Pest and Mosquito Control we provide over 85+ years of Pest Control knowledge and experience into the best overall service for your home or business. We are the elite service provider for SE Michigan because we are familiar with what ALL pests that are in the area and the best approach to eliminate them. Whether you need a one-time service or a seasonal program, CJB will provide you with the best option for your property. We are a family run business with over 85+ years of knowledge. We go above and beyond a typical “Bug Guy”, we provide “Pest Management Professionals” to quickly and effectively rid your home or business from pests. All backed by our industry best guarantee! 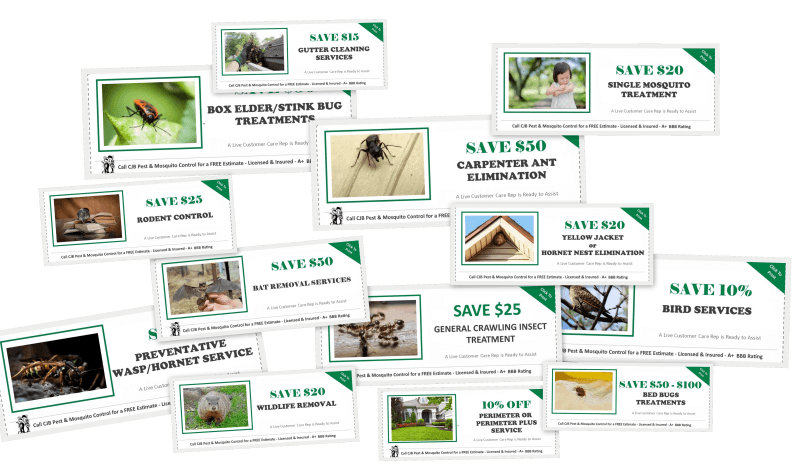 Pest Control Industry’s Best Guarantee: Ants, Carpenter Ants, Spiders, Fleas, Roaches, Stink Bugs, Box Elder Beetles, Bed Bugs, Ticks, Moles, Rodents, Bat Removal, Bird Removal, Wasps, Hornets, Yellow Jackets, Bees. If you are looking for year-round or seasonal pest control protection against pests and rodents, a maintenance plan is just what you are looking for! We offer two types of maintenance that can be tailored to your specific needs. See below for the programs we offer. Our Quarterly Maintenance Program (4 SERVICES A YEAR) for homeowners gives you year-round protection against S.E. Michigan’s most common crawling pests including but not limited to ants, spiders, pill bugs, earwigs, box elder beetles, and other creepie-crawlies. It also covers you for rodents (interior only). All services include recommendations to prevent future infestations via our detailed inspection reports. Always able to get rid of unwanted ants and prevention treatment is great. Very informative and they educate you too! CJB is great! We have used them for 3 years now. They have tackled skunks, moles and insects. They have been very easy to work with, and get the job done. I found CJB on yelp & absolutely delighted! No more carpenter ants...after 5 dozen a day, this is really impressive! “Easy to schedule, affordable pest control. They showed up on time, were professional, and my wasp problem is gone for now.” Susan P.
“I truly recommend CJB Pest organization they are very professionals and very polite. Steve took the time and went over everything step-by-step letting me know what he and his crew were doing, and the prices are amazing, and it’s worth every penny.” Simona H. Westland, Mi. “Representatives from CJB Pest and Mosquito Control were courteous, professional, and honest throughout the process. The bed bug inspection was done on the first visit, and the treatment plan they offered was explained in detail with minimum prep on my part. I was then left to decide at my leisure with no hard sell or follow-up pressure to proceed with the treatment. The first treatment eliminated what bed bugs I had.” Angelique W. Warren, Mi. “Great service. They were able to determine a few places where the mice were coming in and set out the chemical stations in our crawl space and other areas where we had seen activity. I also received some great tips on other preventative measures we need to take” Loren M.
“The service I receive every time is wonderful and has kept any bugs in the house outside. This is not harmful to my little dog which has always been a big concern for me. I am completely satisfied with Brandon from CJB Pest & Mosquito Control.” Elaine S. Dearborn Heights, MI. have done an excellent professional job although the problem has required ongoing maintenance due to factors beyond their control.” Wade R.
“I worked with Nick and Steve to take care of a skunk infestation that I had in my yard. They were professional and sent their team to my house in a very timely manner. The whole process required very little of me and resulted in exactly what was outlined from the start. I didn’t feel pressured to upgrade to better services and all the costs were fully explained.” Sam R. Clarkston, MI. “Both experiences exceeded my expectations – the price was right, the service men professional and yet friendly and they performed the services efficiently and thoroughly. I was especially glad to know that the two technicians I dealt with were State Certified. Jennifer R.
“Perfect service. Very courteous and professional associates. They’ll come back at no cost if the problem reappears. I hired them now for my regular pest maintenance throughout the year.” Caleb L.
“I am allergic to bee and wasp stings, so when I saw wasps flying into a bush by the back sliding door, and they were aggressive towards me it was time to call an expert. CJB Pest was running a special on their website, I purchased, and they were in touch in a matter of minutes. We set a time for their services, and it didn’t matter we weren’t going to be around. They showed, exterminated, and when we returned no wasps. I couldn’t recommend them more. The next time we need services they offer, they will be the only ones we call.” Joanna L.
“Shawn was professional and knowledgeable. He answered all my questions and addressed my concerns. The pest control treatment worked great! No more wasps and we can enjoy our yard again!” Jolene L.
“All of the staff that I spoke to on the phone were professional, helpful and responded quickly to providing me a quote, scheduling of the work and submission of insurance to comply with my commercial building requirements. The team was well organized and efficient. The inspector was thorough, personable and professional. I would definitely contact CJB for any future needs that I might have and recommend them to others. Richard A. Pontiac, MI. “The service professionals were excellent about explaining the procedure and answering all my questions. They were all friendly, polite, and prompt and were efficient in their work.” Matt A. “Timely response to my initial inquiry. Professional, friendly and thorough professional pest control staff who came into our home on two occasions to manage the two-step process to address the carpenter ant problem. We have not seen any evidence of ants since.” Gail W.
Guarantee bat removal and we provide you a 5-Year written guarantee against any new bats getting into your home through the openings we seal off. This months special is 10% off bat removal and inclusion. If you are seeing activity outside of your home and want to prevent them from getting inside try our Carpenter Ant Exterior treatment. This service provides a detailed treatment to all the areas Carpenter Ants would attempt to enter your home for food, water, or possible nesting. We also apply insecticide granules around the perimeter of the home to give you an added layer of protection and lessen the insect population (carpenter ant food) as well as bait granules for them to take back to the nest. Mice getting into the house is a huge problem, but can be quickly and easily resolved with a trip from the exterminators at CJB. We will inform you, the homeowner, on where they entered the home, what needs to be sealed to prevent future entry and address any environmental attractants. We can also give you a quote on pest-proofing your home from the outside. Our treatment is pet-friendly, and we check out ALL the possible nesting and travel points within the home. Click on the “Read more” for more specifics on the treatment. Rats are an environmental problem more than a specific homeowner’s problem. Many conditions can make a rat want to be around your property or inside a crawl space. We will eliminate your problem quickly, and let you know what should be done around your home and property to prevent future issues best. Calling in a trained, licensed professional is the best way to exterminate rats. Click on the “read more” for more specifics on the service. Our flea treatment from start to finish is the most efficient and affordable to wipe the infestation out from your home or business. Get your pet a flea treatment before the service and have them on a topical medication after for at least 30 days. A 2-step application process (14 days apart) to eliminate the adult fleas at the time of service and the new fleas as they emerge from the eggs. 6-Month Guarantee to ensure they are gone and STAY GONE! Step 1: Provide you with a prep sheet to ensure the best treatment and corrections needed. Step 2: Best residual treatment and bait applications to wipe out the population quickly. Step 3: 6-week follow up application & inspection to ensure complete elimination. Step One: We will come out to the property for an estimate to determine the size of the problem and if anything in a surrounding areas is a threat. Step Two: Use a bait that mimics their natural food source to kill the moles to quickly. Spiders are known to breed outside, but there are times when they feel the need to move to a place that offers shelter, moisture, and warmth. These are the three most important reasons why spiders move indoors. If this is the case, and you are dealing with a spider pest problem, a good option would be to call CJB Pest, a professional spider pest control company. Whether you are looking to treat your home, deck, or shed to kill and prevent nesting or wasps or hornets, or just looking to eliminate a specific nest from yellow jackets or hornets, make sure you chose the right kind of company like CJB Pest. We will remove and knock down all nesting “on” the home, and stand by our industry best Guarantee’s. We will also give you a detailed inspection and recommendations to help prevent bees from entering the home itself. Click on the “Read more” for more specifics. We want you to feel satisfied that you’ve chosen a pest control company that strives to be the best. We take pest control very seriously and always have the homeowner/family best interest & safety in mind.